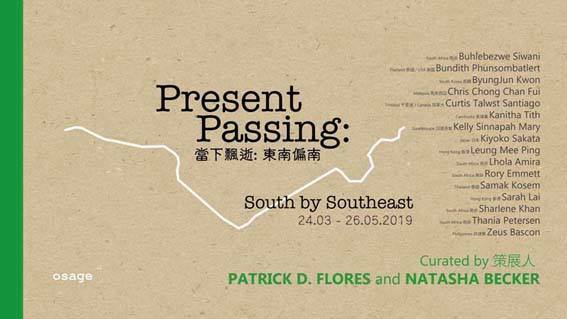 Present Passing: South by Southeast” presented by Osage Art Foundation, curated by Patrick D. Flores (Philippines) and Natasha Becker (USA), will bring together 16 artists in total – 5 from South Africa, 2 from the Caribbean, 7 from Asia/Southeast Asia and 2 from Hong Kong. “South by Southeast” is a part of Osage Art Foundation's "Regional Perspectives" platform that puts the production of art in Asia into a critical perspective in relation to other geographies; and “Present Passing” is an iteration of the “South by Southeast” framework that seeks to expand and deepen the imagination of Southeast Asia. It releases this region from commonplace assumptions about its scope and unburdens it from the legacies of the colonial theater and Cold War geopolitics. It thus offers coordinates through equivalent articulations of the Southeast elsewhere. The first exhibition of “South by Southeast” in 2015-2016 in Hong Kong and Guangzhou brought together Southeast Asia and Southeast Europe, dwelling mainly on the formation of subjectivity through image, memory, and material condition. As its next iteration, this exhibition sets its sights on the ties between Southeast Asia; the Caribbean, which is southeast of the hegemonic North American mainland; and South Africa, which links to Southeast Asia and the Caribbean through seafarers. This South by Southeast option leads us to revisit how we reflect on the place of region in the contemporary. It does not only broaden the sympathies of Southeast Asia, which is the main node of this network; it gestures towards a theory of the global, the worldly, the hemispheric through not only the south but through the southeast: not the center twice, the better for it to slide across the scales and registers of the geopoetic spheres of exciting mingling.The show features sixteen artists whose work, spanning photography, sculpture, video, installation, painting and performance, investigates the nuances of this intersubjective space.